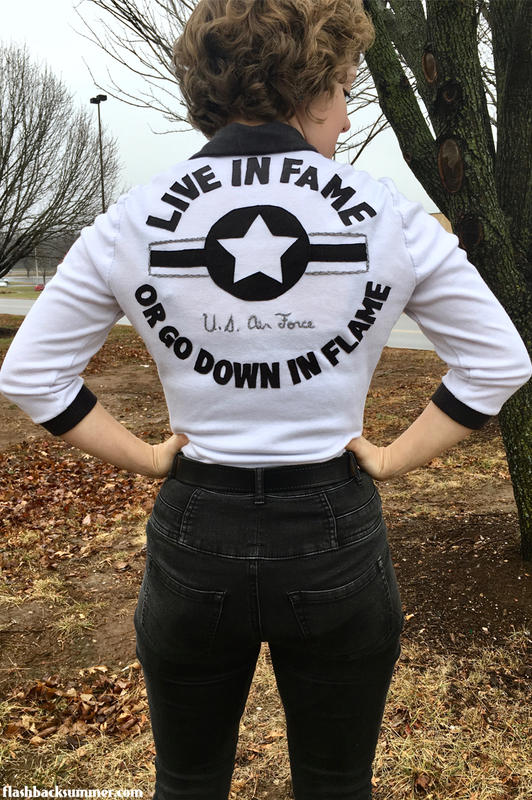 I'm pausing the #vintagedecemberstyle to share this Air Force themed shirt I made and wore on my birthday. As I said in a previous post, my measurements are changing. It's been a good catalyst to delve into sewing knits! This is my second project with a knit (the first will be posted later), and I'm pretty pleased with it. 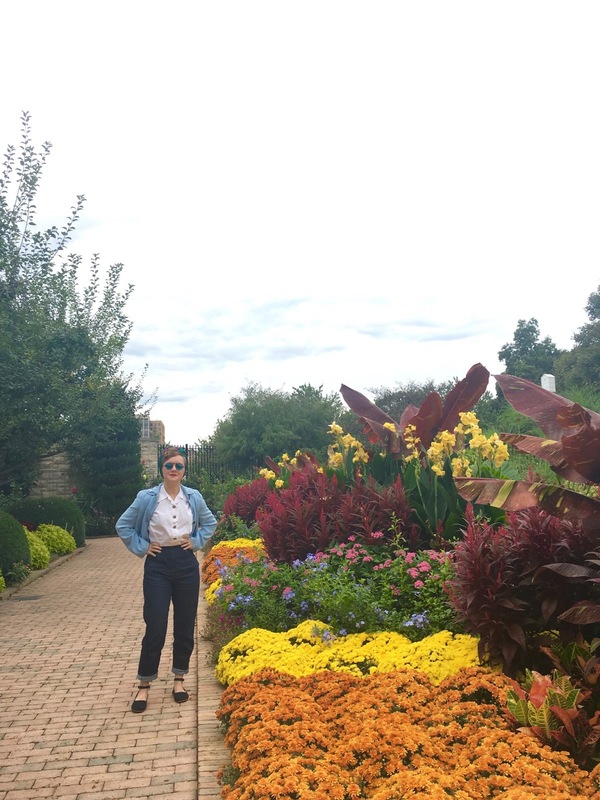 This outfit is also a good example of a casual, vintage-inspired look that I wear often. I love vintage, but I also really love skinny jeans! Today is my 26th birthday, and I'll be celebrating with my family with lunch and a Star Wars viewing! My father's birthday is tomorrow, and we're all gearing up our Christmas travel this week, so we're keeping it simple and celebrating together today. Are you ready for a SUPER festive outfit?! 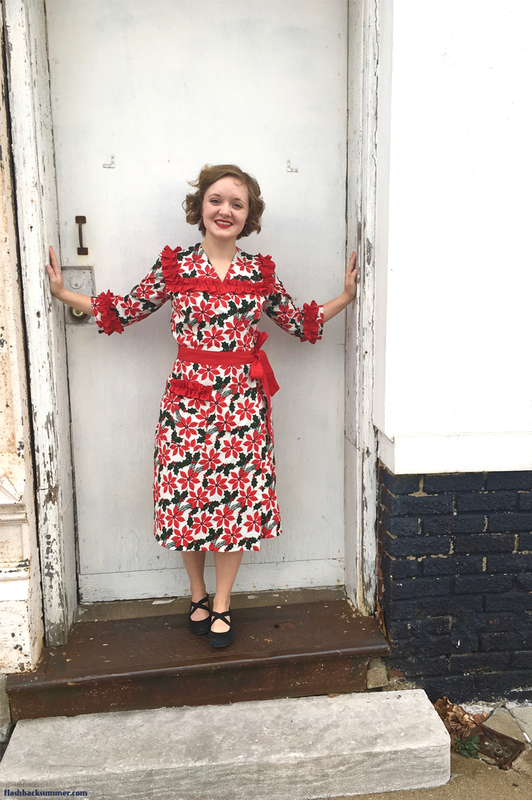 Check out my most recent make, a 1940s poinsettia dress! 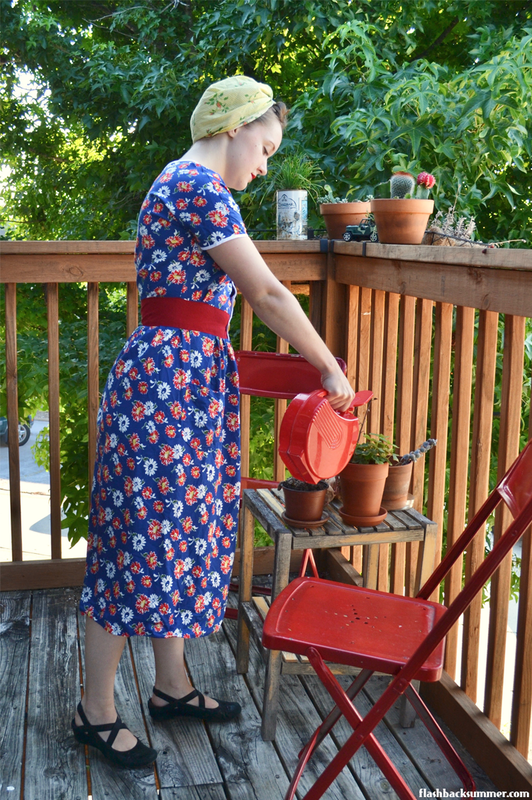 When I saw this fabric, I initially intended to make a gathered skirt. Next, I thought I'd make a wiggle dress (for which my red gingham version was a test muslin), but as fabulous as that is, I am really in need of more comfortable dresses rather than dressy ones. When this gifted 1940s wrap dress/robe pattern from Amy of Myscira Makes arrived in the mail... I realized it was perfect! 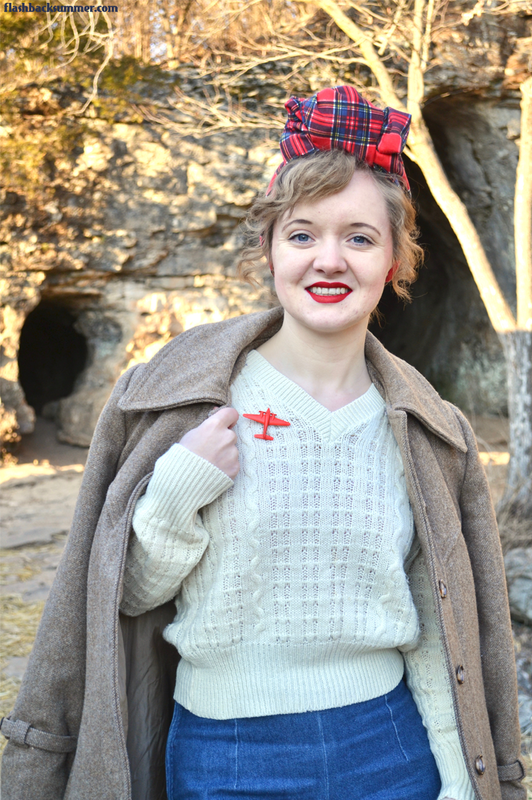 There's nothing like a brooch to turn an everyday outfit into a holiday outfit! 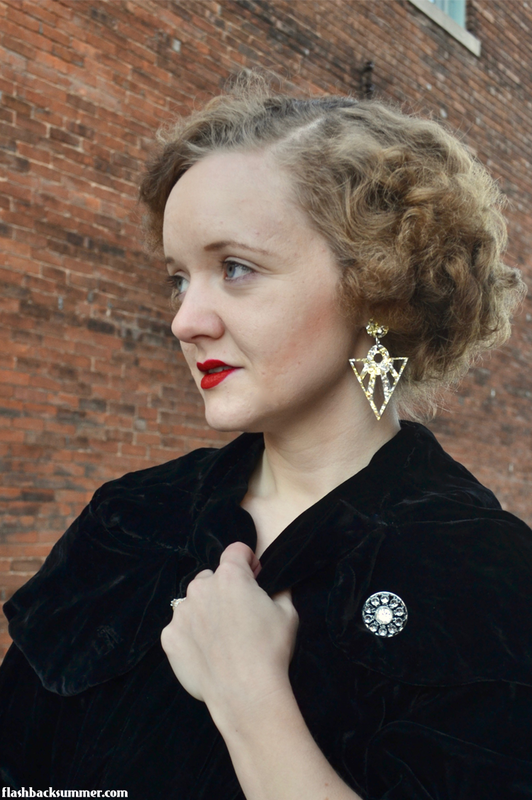 The simple addition of a themed brooch can turn a green dress into a Christmas dress or a navy suit into a festive Channukah ensemble! 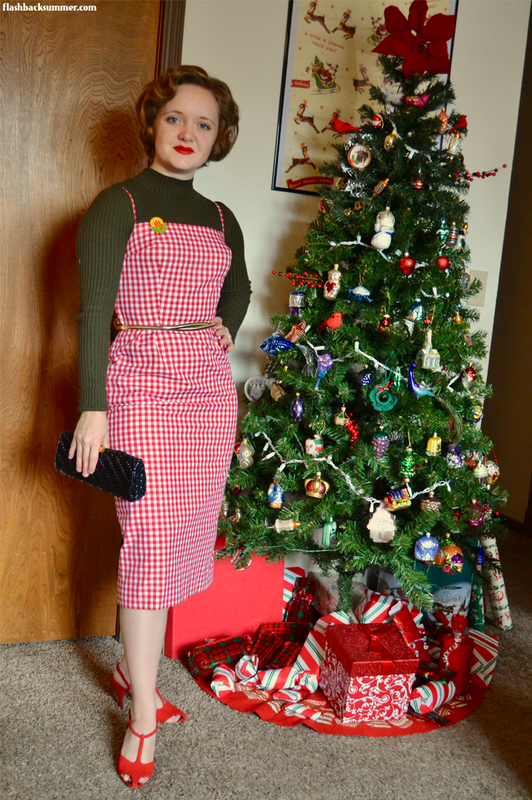 As we continue this month of holiday clothing, I've got a tutorial for you guys! 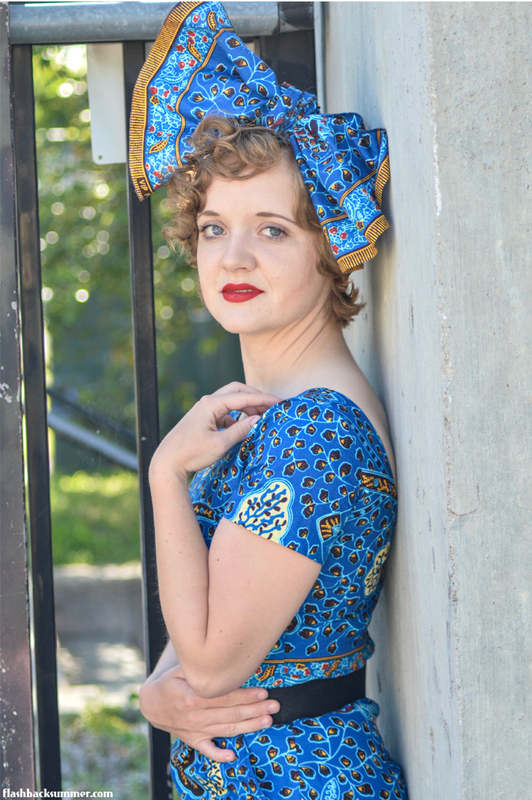 One of the easiest way to add holiday style to your wardrobe is to make a skirt out of a fun novelty print. You can use holiday fabrics or even repurpose old tablecloths. 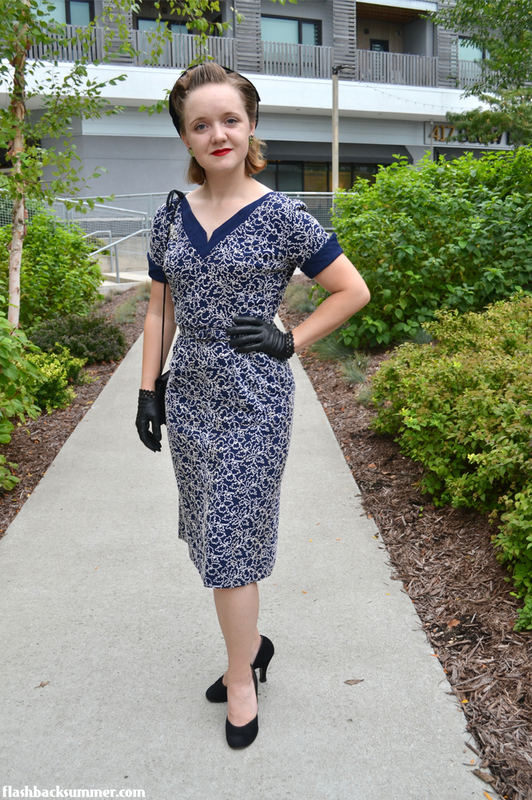 Although you guys know I tend toward 1930s and 40s styles, there are some items from other decades that I just really love, like 1950s suits and--today's feature--50s/60s spaghetti strap wiggle dresses! 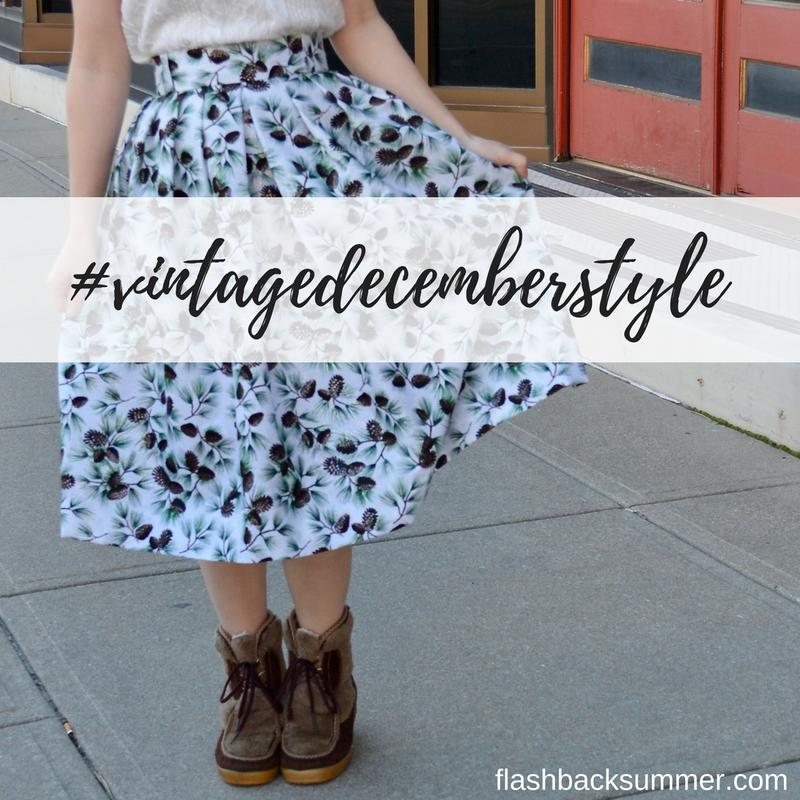 I want to invite you to participate in a fun and easy style challenge for the month of December! Whether you're celebrating Christmas, Hanukkah, Kwanzaa, or any other holiday in December, share your themed outfits they've inspired! This 1930s Art Deco goodness is a result of my first traced pattern trade! As silly as it sounds, although I've been sewing vintage for years, this was the first time I've ever traced and traded a pattern. As the calendar days get crossed off, I keep expecting it to feel like November. Normally, November is pretty chilly and rainy in Missouri, but this year we're experiencing quite the Indian summer. It's still quite warm. In fact, I was perspiring a bit even while wearing this light, short-sleeved dress. Perspiring in November! Who ever heard of such a thing around here?! Every once in a while, I run across a dress that is really unique. In fact, this dress is so unique that I'm pretty sure I tried it on backwards the first time because I couldn't tell which way it went. The back is as pretty as the front! This month is an AMAZING milestone for Flashback Summer! As of October 17, I have been blogging for five years. FIVE YEARS! Most blogs don't last more than a year, and I'm honored to be celebrating my five year "blogiversary." I laugh now when I got back and look at my first post and, well, pretty much anything from that first year! How far I've come in knowledge, skill, and relationships. It's been an honor getting to know many of you through this blog and sharing my life with you. While I have many changes coming up in my life, I hope that this blog will continue into this future. You guys have made it such a wonderful adventure, and I appreciate every comment, share, and like more than you know. I'm on a constant search for hats that flatter my round face and short hair, and I finally decided to start making my own. I've found that a beret works well for both my hair and face shape as well as being a classic style that works for any decade. I decided to look through my patterns and stash to see what I could come up with for a low-budget topper. Although it's supposed to be fall, it's still quite hot here in Missouri. I have yet to put away my summer clothes, and I was delighted to try out this new sleeveless dress I received from Happy Yellow Dress to a friend's baby shower in a park. 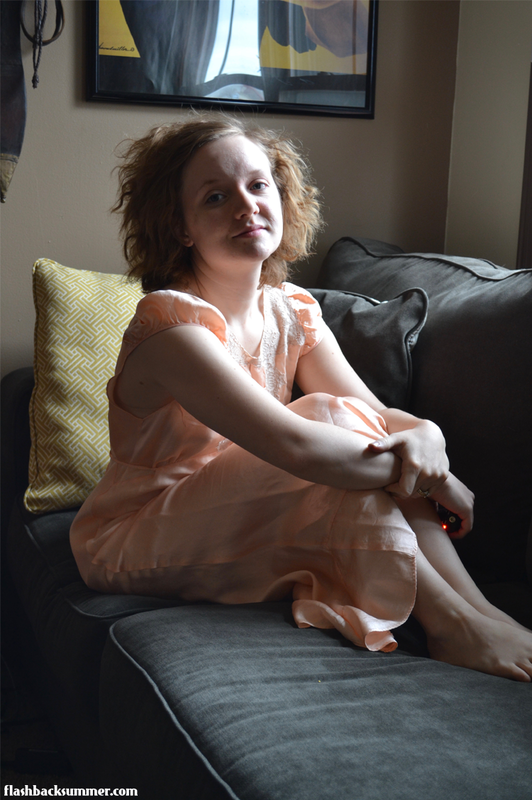 The weather turned out to be just perfect, and this breezy cotton dress was super comfortable. Not to mention it accents my runner's/farmer's tan beautifully, haha! 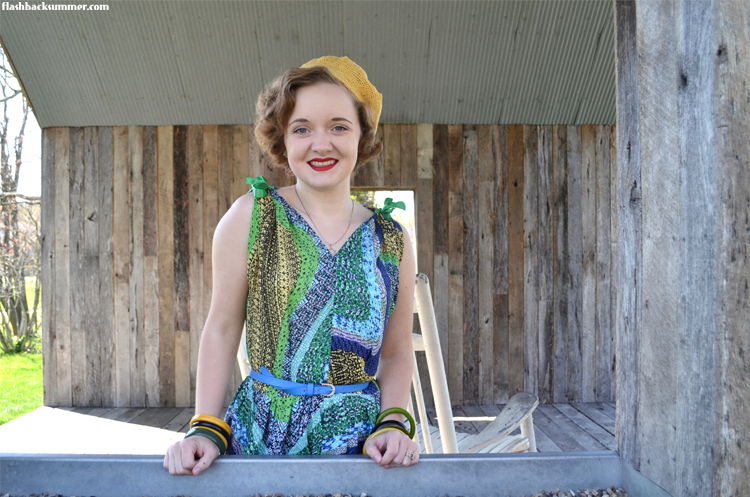 Today I have a rare jump into 1950s style! 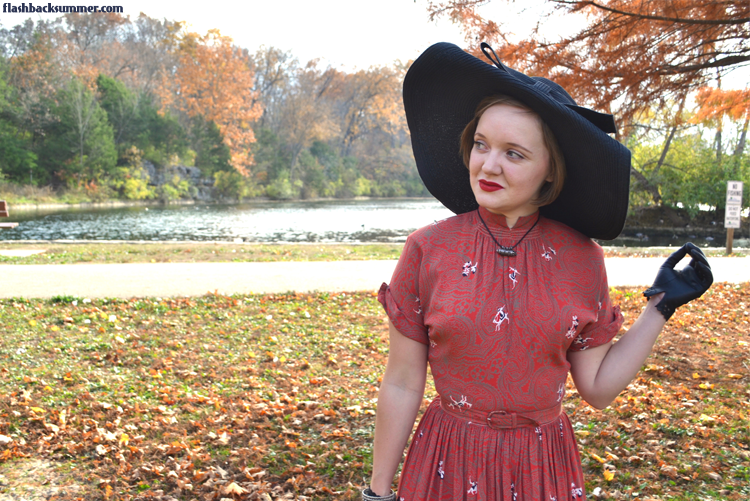 I don't often wear anything post-1940s, but this dress was so perfect in fit, style, and comfort that I had to add it to my closet. I saw it at a clothing swap, and it aligned wonderfully with the goals I have for my wardrobe: navy blue, easy to wear, flattering neckline, great fit. It actually fit without any alterations, a rare treat indeed! 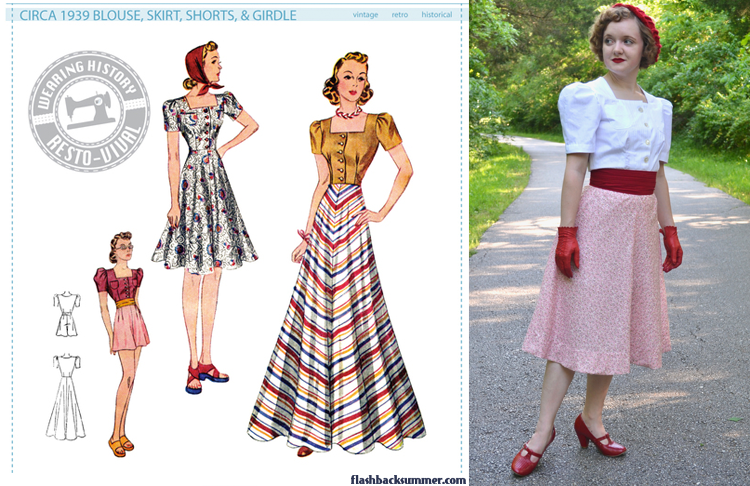 I also like that, although it's 1950s, the V neckline has a bit of a "V for victory" motif to me. 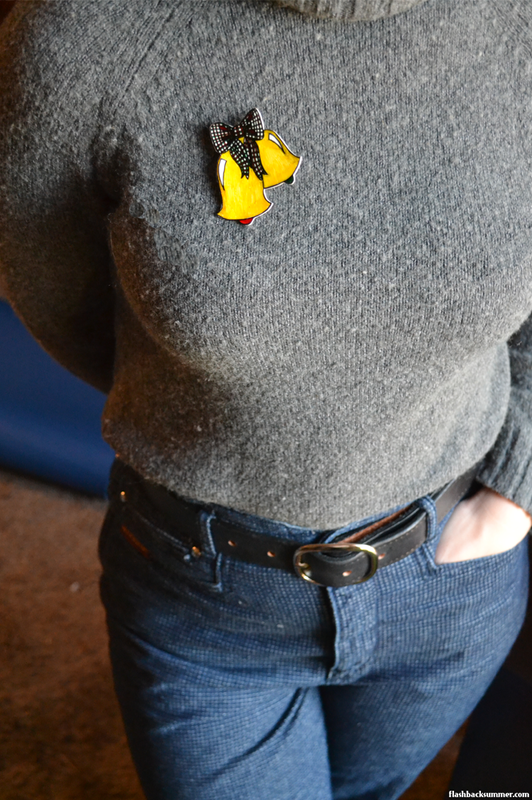 I can definitely picture wearing my patriotic brooches with it in future stylings. I decided a while ago that I need more house dresses in my life. While I have had slow progress toward that goal as life has gotten busy and my sewing has slowed down, I have finished this dress! 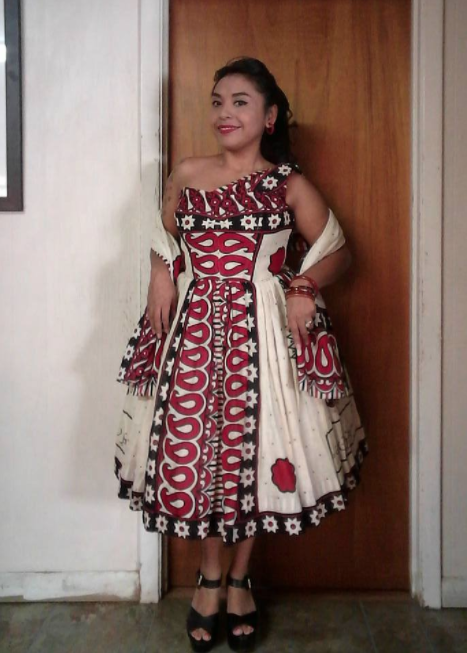 I made it out of a bit of fabric someone gave me as well as some red cotton scraps from a blouse that is in process. 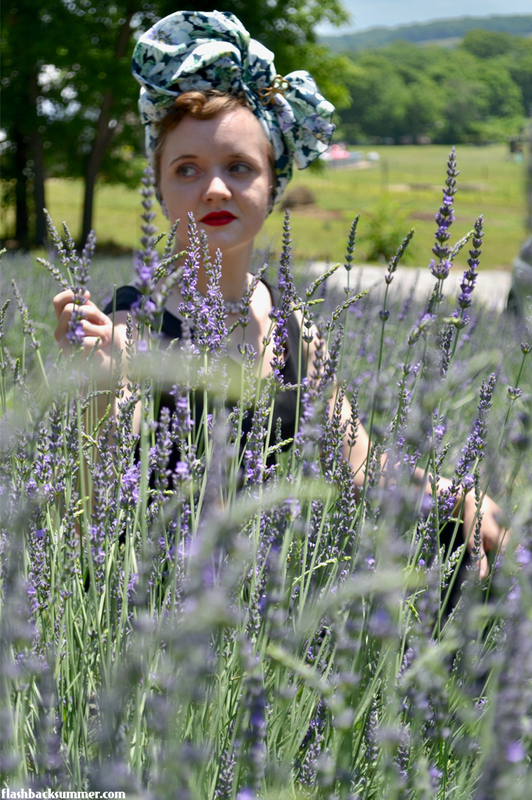 One of the best parts of summer, in my opinion, are blooming lavender fields. They don't last long, but while they're blooming they're some of the most beautiful sights to see! In Missouri there are only a couple lavender farms, and one of them is about 30 minutes from where I live in Clever: Lavender Falls Farm. As I shared about in my last post, I received this fabric c/o Ankara & Lace. 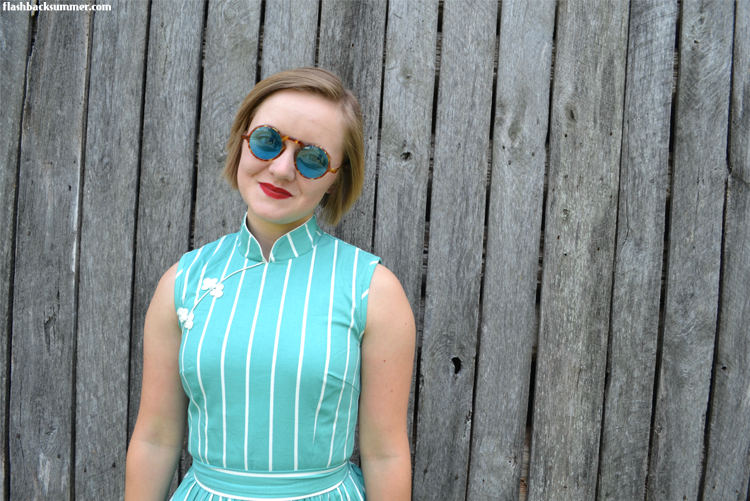 I took their style quiz, and I was quite pleased with this fabric they picked out! I wanted to try something new with it, so I talked to my friend Esther. Our world is increasingly global, and we have the glorious opportunity to buy clothing from designers hailing from all over the world! Whereas our foremothers were relegated to buying such fashions only if they could afford to go to resorts and buy a vacation wardrobe inspired by local aesthetics, we now have the chance to incorporate the beauty of diverse designers into our own wardrobes at a single click! Today I'm partnering with Ankara and Lace, an African fabric subscription company, to help explore how to do this. I just had one of the most fun weekends ever! 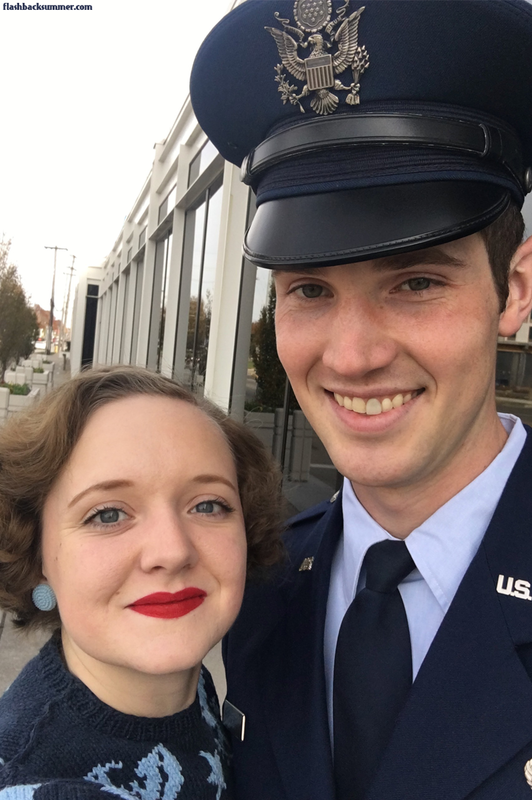 As my husband is away for a couple months at military training, I decided to treat myself to a trip to meet Emily Stringham (of Emily's Vintage Visions) and her husband at the Mid-Atlantic Air Museum World War II Weekend. Emily and I have been internet friends for a while (I think we started blogging around the same time), so it was very exciting to meet her in person! 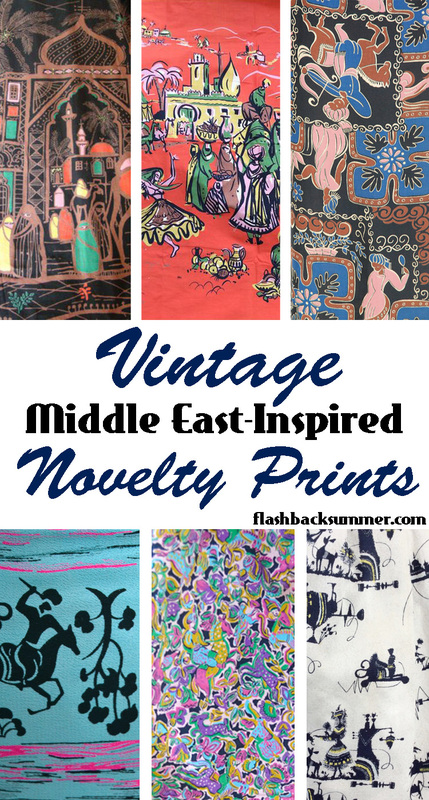 In a previous post a loooong time ago, I highlighted some of my favorite Middle East/North Africa themed novelty prints that I had found across the internet. I thought it would be fun to do an update post, for since then I've acquired some of the prints on that list and some new ones popped up along the way! I'm always glad when companies offer petite sizes. As a short person, I often find reproduction garments that fit in the bust, hips, and waist... but they're all in the wrong spots. The waist is below mine because the torso is cut too long for me, the apex of the hips are at mid-thigh because the skirt is so long. Busts fit but shoulders and necklines are too wide. These things are fixable, but it's often an involved process, and--honestly--not usually worth it to me to do on a reproduction item. Enter PUG petites! 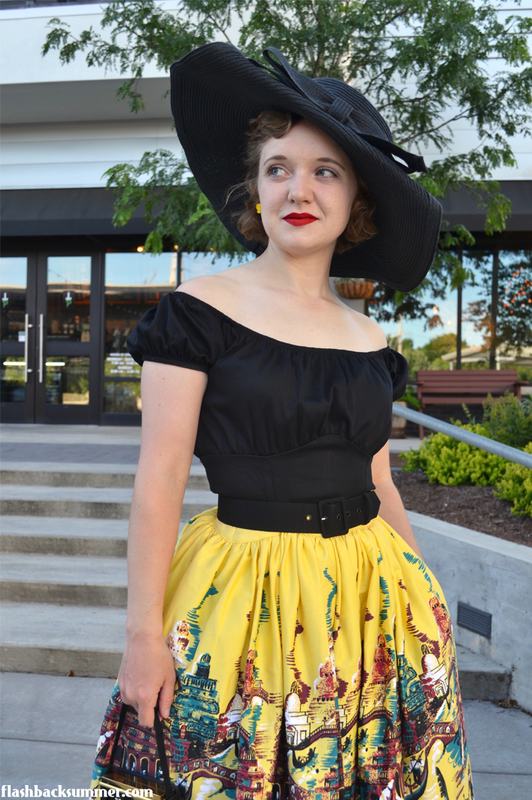 I am pleased to show you a skirt from their petite line, the Petite Jenny skirt in Yellow Italian Landscape. I've paired it with the black peasant top. These are my first pieces from PUG, so I was intrigued to examine the quality and see if the sizing really worked for me. 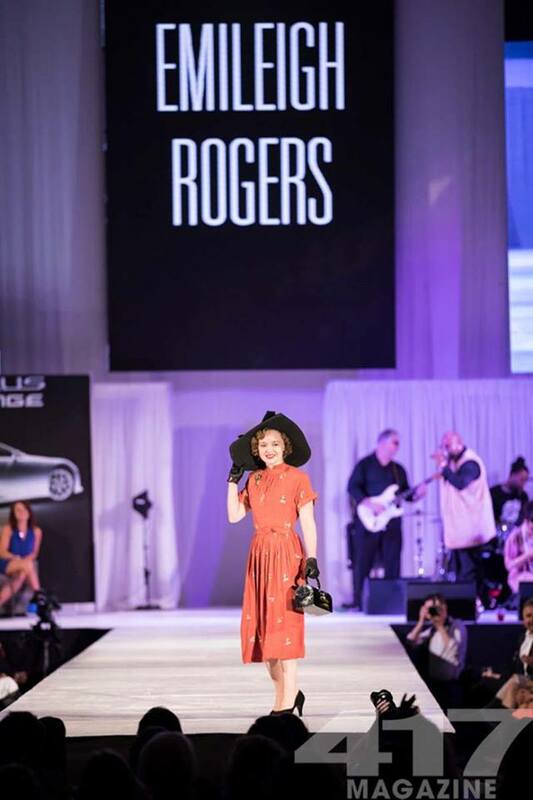 Admittedly, I'm also branching out for a silhouette that I haven't worn much... but I have to say I felt FABULOUS! 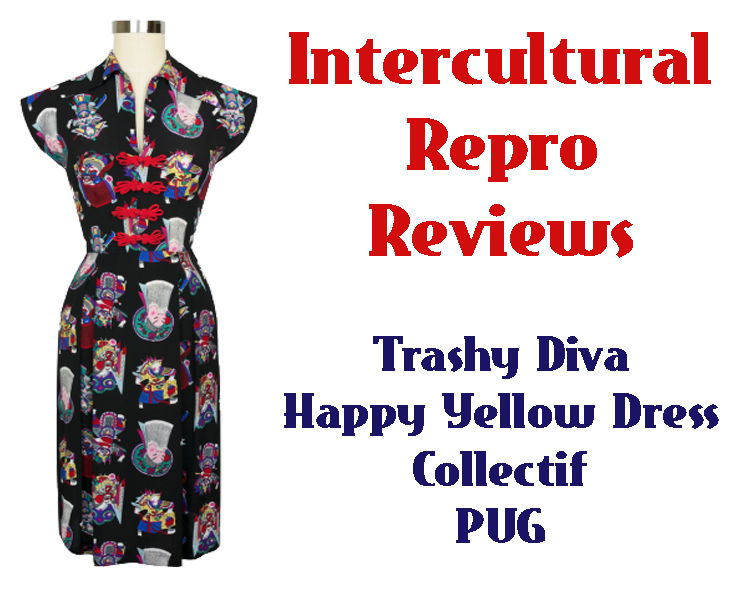 You may have seen some of the drama relating to intercultural-vintage pieces available in reproduction shops lately (intercultural-vintage being my word for vintage-styled pieces that draw aesthetics from a usually non-Western culture). The most notable seems to have surrounded the Dragon Print series from PUG, and it got some pretty strong responses. I am not at all here to pick sides in any of these arguments; I just want us to take a pause and look at some other intercultural-vintage pieces and discuss them. 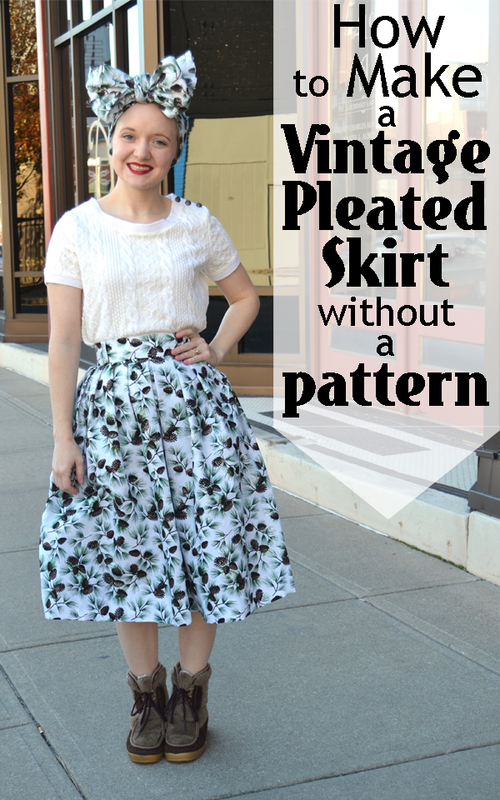 As you guys know, I'm a fan of the Wearing History vintage reproduction patterns. 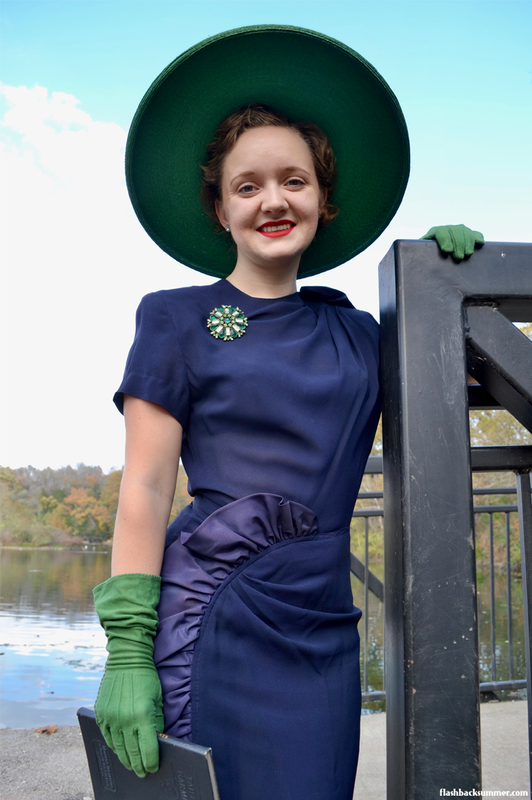 When Lauren, the owner, asked if I'd sew up the 1939 ensemble pattern and photograph it, I was happy to oblige! 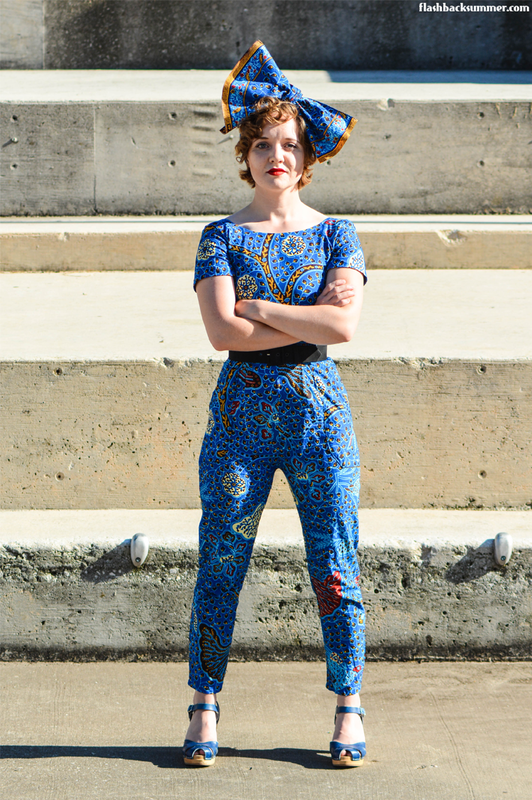 She didn't have any pictures of the pattern actually sewn up and styled for the site, so this was a way to help my favorite pattern company and get an awesome pattern in the process. So it's been a bit of a turbulent time for me as many changes are about to happen. I just found out yesterday that I'm being offered an officer's commission in the United States Air Force! I started the application process two years ago, and I am elated to begin this next chapter in my life. I don't have timelines or details quite yet as to how quickly I will go to training or any of that, but it will undoubtedly change many things in life! 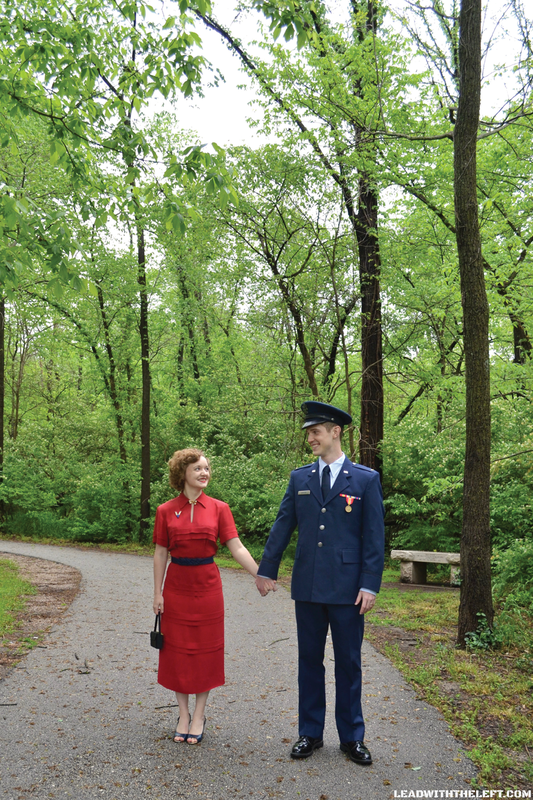 As some of you may have seen on Instagram, Jacob and I went to a military ball last week! As you may also have seen in Instagram... I posted about it on the blog Jacob and I co-author, Lead With the Left. I'm finally posting about my dress I made for the Easter Spring Dress 2017 challenge! I learned about it on Akram's Ideas, and I decided to do something different and share a video about it with you guys. I'm not going to become a youtuber any time soon, but videos are definitely fun to make every once in a while! Since a lot of info is in the video, I've posted just a few pics to give you a view of my Easter look this year. If you have any other questions about the project, just comment below and I'll be glad to answer! I've been slowly revamping my wardrobe, and my goal the last few months was to make items largely out of my stash fabrics. I don't have a HUGE stash, but it's definitely been motivating to use what I've got and go easy on the sewing budget in the meantime. It's also been good to get me out of my comfort zone. 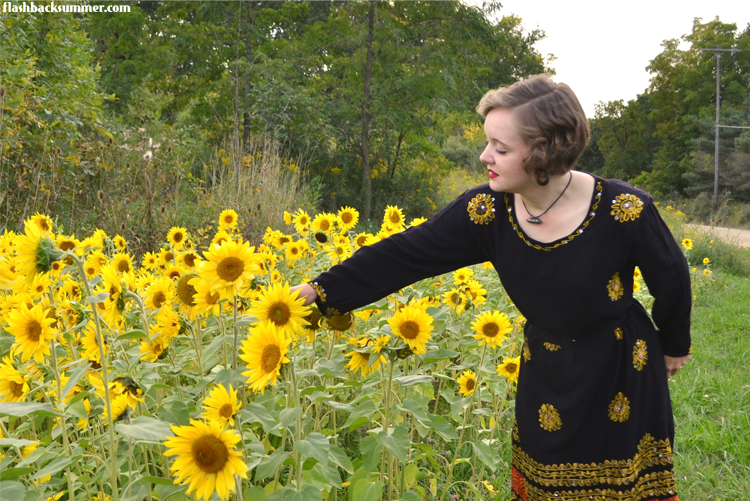 I have some fabrics, like the one I used for this dress, that aren't colors I typically wear or to which I am usually attracted. This giveaway is now closed. Winners are announced below. 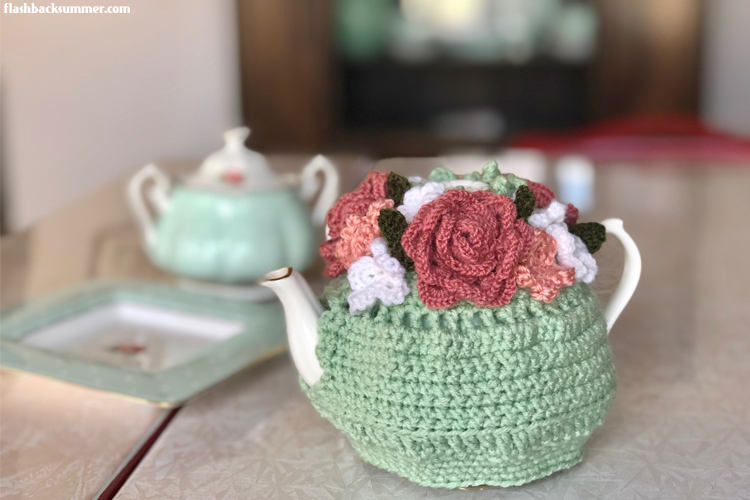 It's been lovely seeing the encouragement of women and their achievements this month, and I wanted to end with a "thank you, readers" giveaway! I've gathered items from a few small shops run by women and a few other pieces, and I think you guys will really love them! I have two prizes available in this post, and another two prizes available at my Instagram profile! The giveaway closes April 7 at 12AM. Good luck! 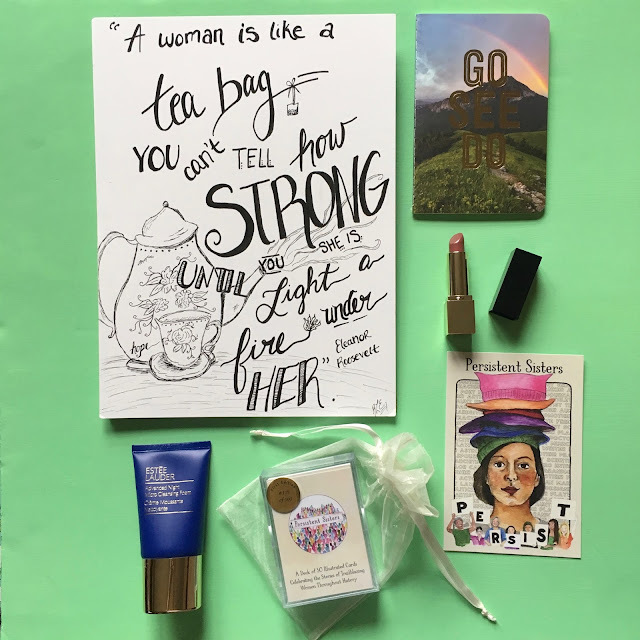 This giveaway has original art, makeup, a cute notebook, and an amazing collector series of cards featuring influential women from history! 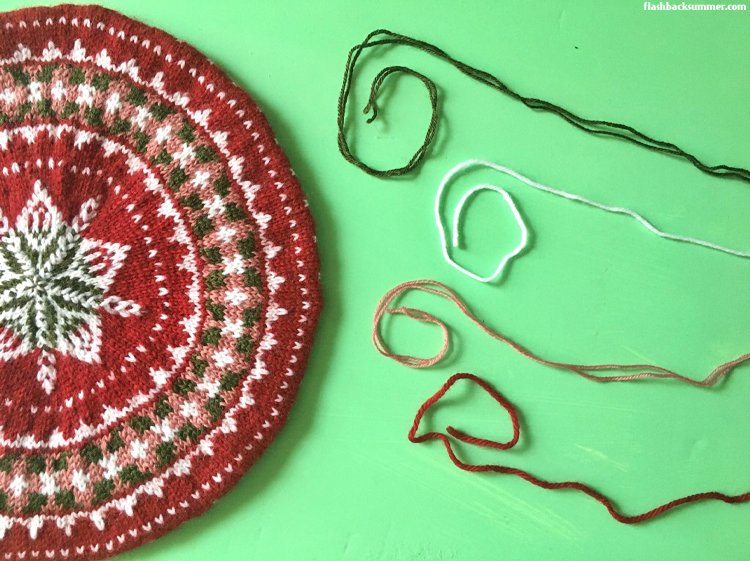 This pattern shows you how to make the felt patch above featuring our classic favorite, Rosie! 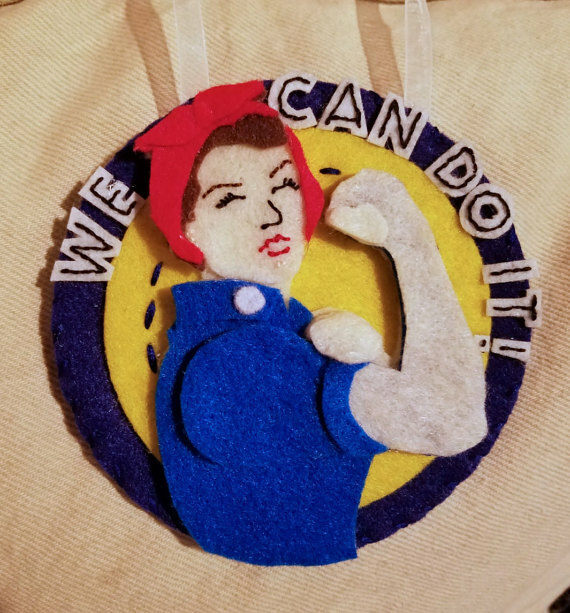 This can be used as an ornament, wall hanging, or anything else you'd like to decorate with some 1940s empowerment. "Jacob, you know what we should do? Rearrange the bedroom. 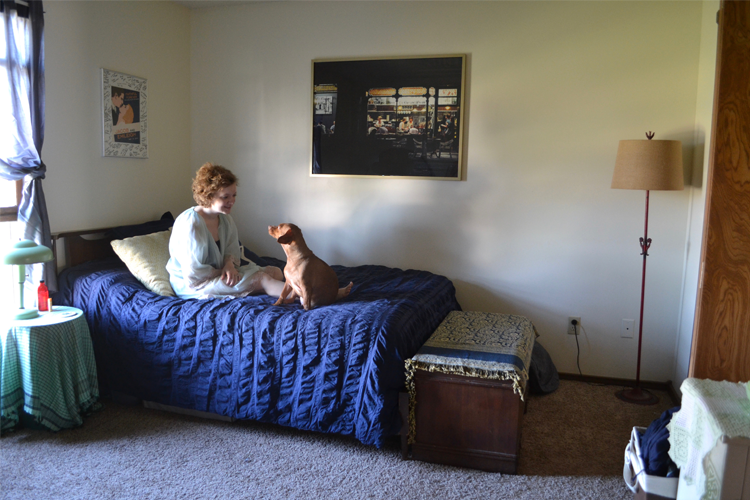 We've lived here for a whole year and we've never changed it around." "We haven't lived here a year." "What? Of course we have. We moved in in... in..."
"We moved in here last October. It's been four months." "ARE YOU SERIOUS? How is that possible?! It feels like forever!" 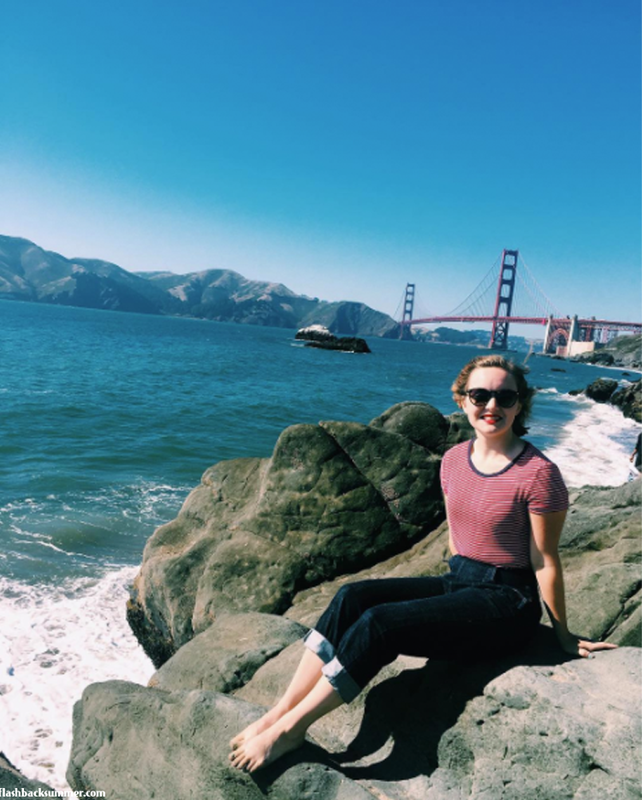 I've rounded up some of my vacation outfits to share with you guys, along with some stuff I discovered to aid you in your shopping while there! 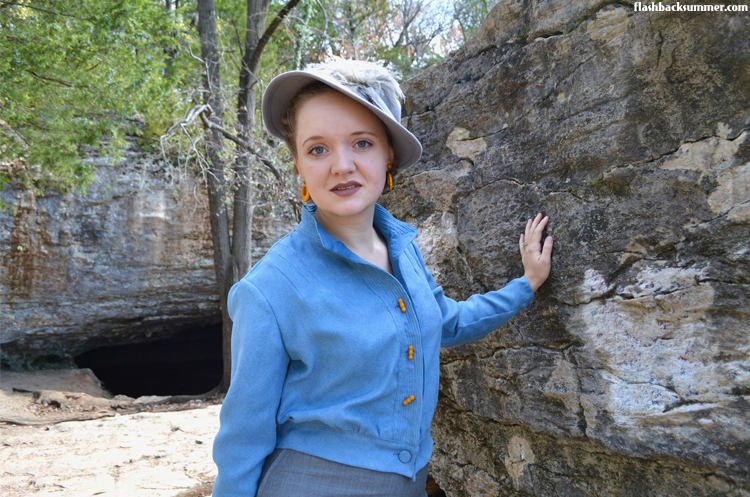 I really loved getting to wear southwest-inspired vintage that looks a bit out of place in my home in Missouri. (Although that doesn't stop me from wearing them, make no mistake!) 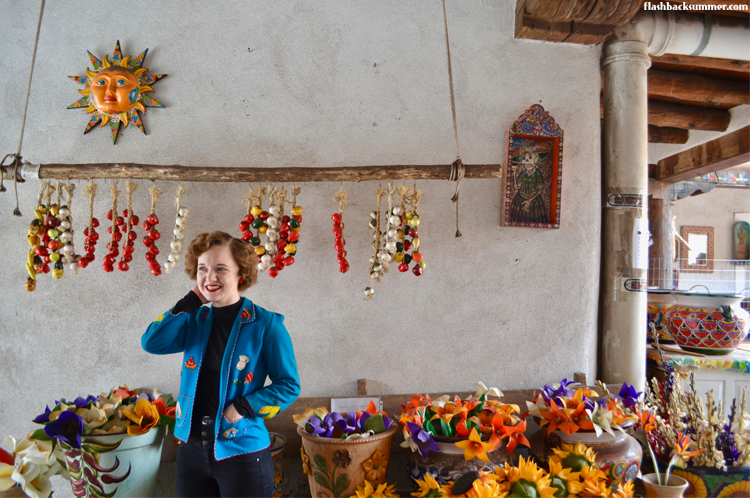 I also found a really great deal on this kid-sized Mexican tourist jacket, and I bought it special for the trip! I am excited to share this post on the Frijoles Canyon Cliff Dwellings in Bandelier National Monument, as it was one of my favorite spots we visited. 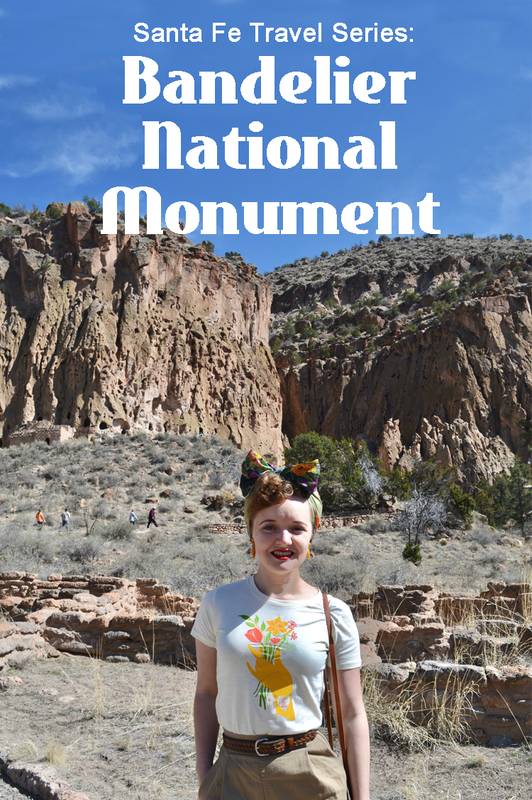 Talk about idyllic southwest scenery and history! 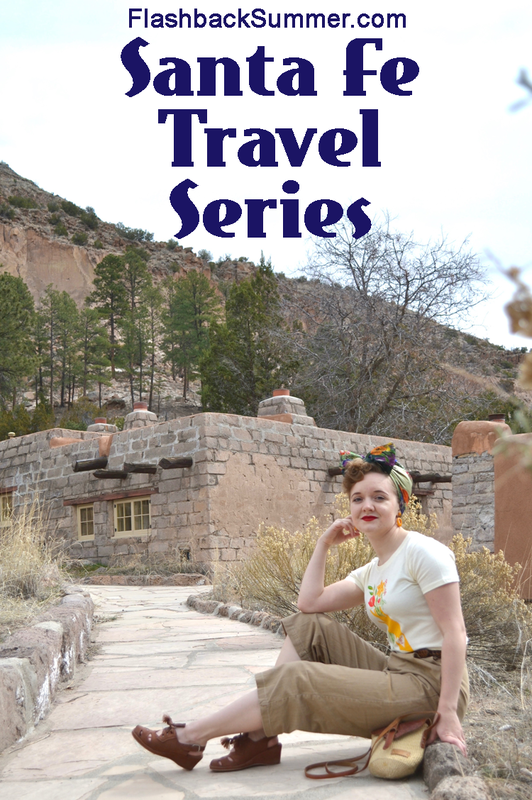 A blending of Native, thousand-year old cliff dwellings and more recent vintage history of quaint lodges and an adventurous female. What an amazing week I've had! 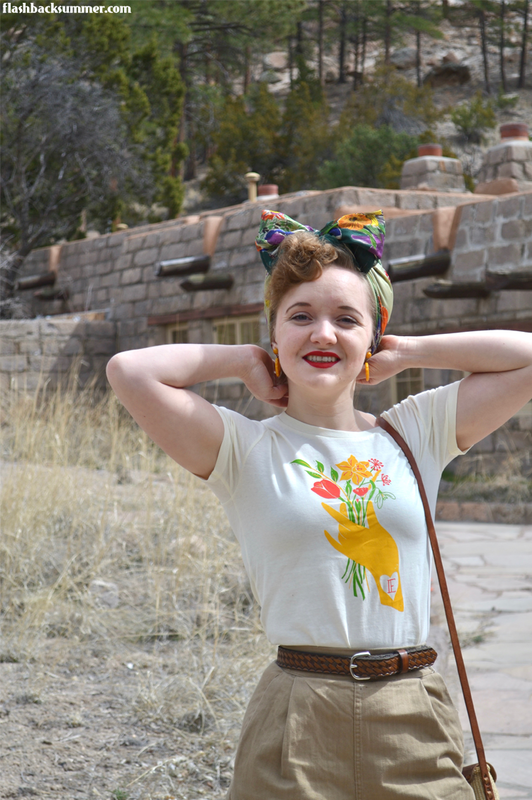 I've been keeping it on the DL, but last week my family and I went to Santa Fe for spring break! It's the first time my parents, sister, my husband, and I have all been on the same continent for an official family vacation, so it was especially lovely. The cool thing about the United States is that it's a big country, and there's a HUGE amount of things to see and do. We have a diverse history, an impressive range of natural settings... so it was a bit difficult to narrow it down. Even though I, of course, was raised largely in America, most Americans haven't seen all there is to see here. There's just so much! My sister suggested we go to Santa Fe, New Mexico. None of us but her had ever really been to the southwest of the U.S. before, so we were up for trying something new! It was a FANTASTIC vacation, and I'll be highlighting some of the things we did, my desert-travel fashion, best places to visit, and tips in a series here on the blog. Today I'm starting with some of my top tips and advice if you ever venture down this way. 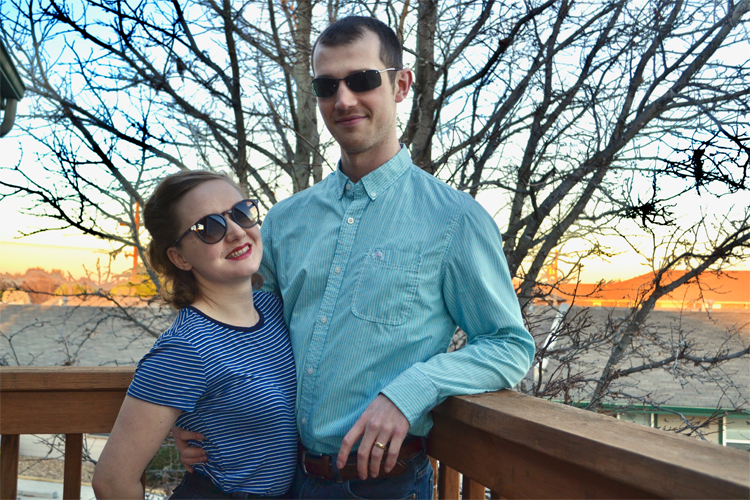 "Is your husband into vintage, too?" "What does your husband think of your clothing?" "Does he like old stuff?" 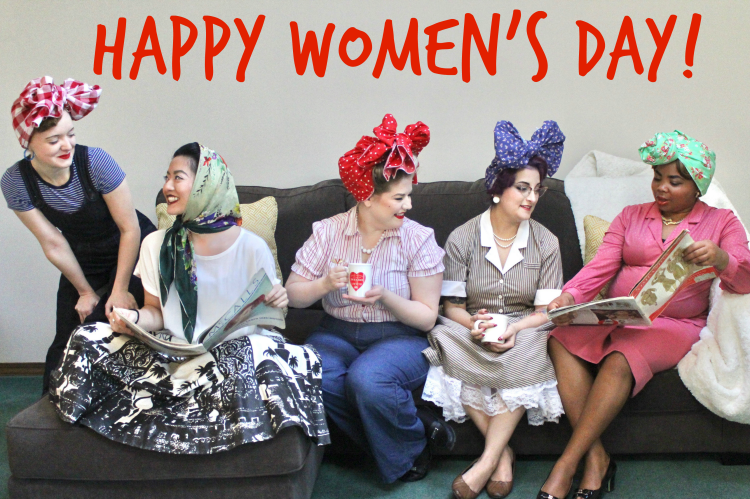 Today is International Women's Day, and I want to celebrate by sharing some encouraging notes that I hope will help you feel strong and empowered today! I'll be doing some more posts throughout March for Women's Month, and I've even got an exciting giveaway coming up to celebrate. Stay tuned! 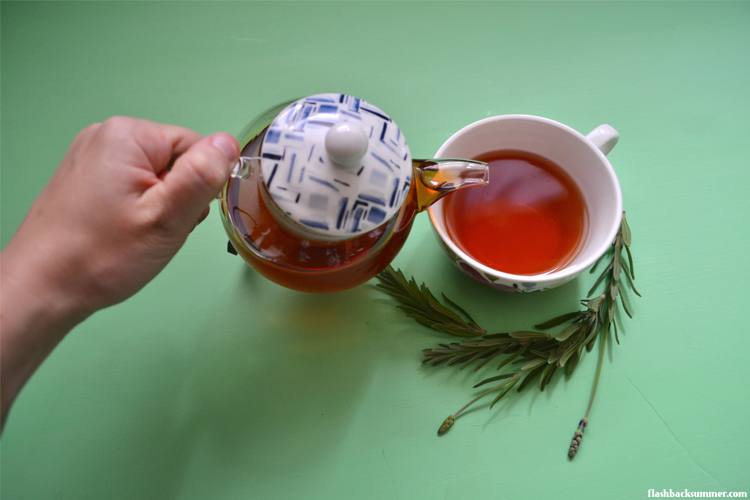 This is a follow up to my first post featuring some of the lovely things in which I like to lounge about the house! 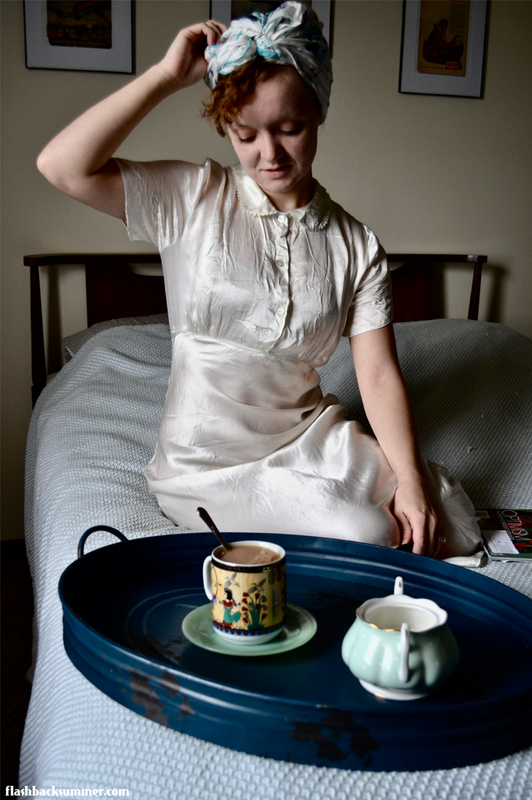 Today I'm featuring this pale peach 1930s nightgown that I absolutely love. It was one of those rare items that fit me without any alteration when I got it! Truly magical! It's made of the softest, prettiest silk charmeuse. Basically I want to live swathed in silk. The early 1920s is one of those periods that has some really, really lovely fashions but very little of it is being reproduced. 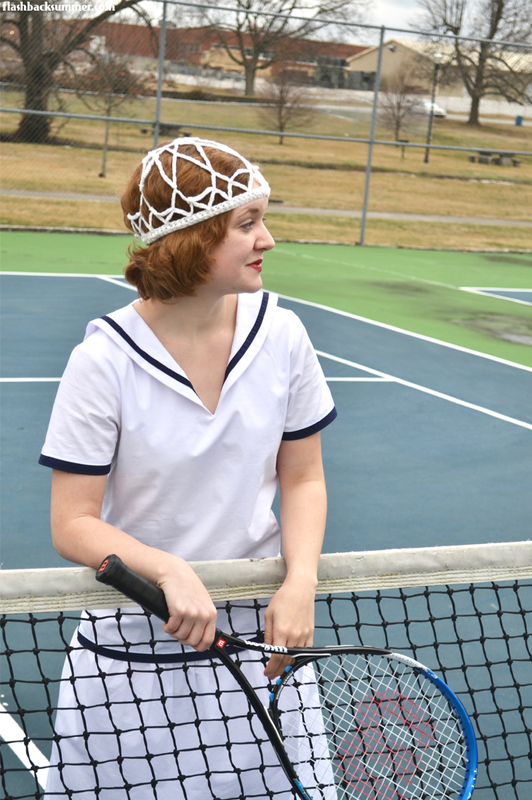 I especially love these few years in fashion because they begin to embody the comfortable, flowy styles the 1920s are known for, but they're often done in ways that are friendlier to a wider variety of body types. 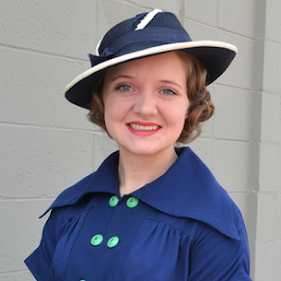 Many early 1920s dresses have longer lengths, layered styles, and a defined waistline at or right below the natural waist. 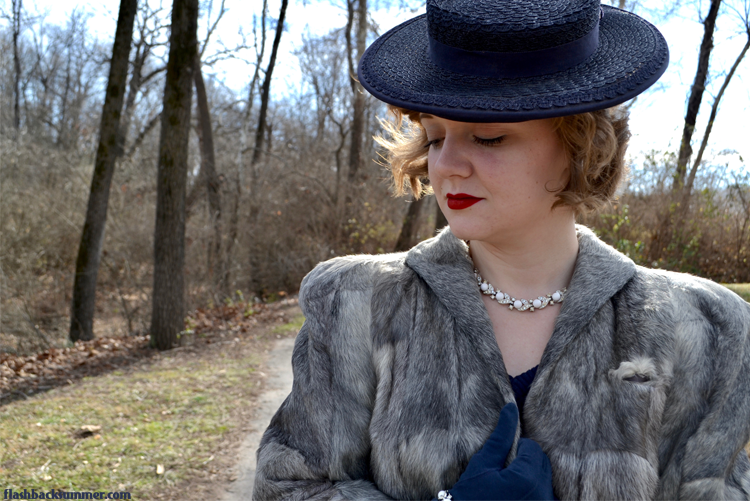 While I absolutely love 1920s party dresses, I can't wear them every day! I do have to wear some more hardy, casual clothing for my daytime, regular-life activities. I was so pleased to discover the House of Recollections Etsy shop when I was searching for such pieces! I love the power of accessories to take a look up a notch. When I discovered Revere Folie, a handmade and vintage-inspired accessories shop, I fell in love with the fun shapes and shininess! A 1920s beaded party dress is ALWAYS welcome in my closet. They're decadent, they're comfortable, they're fabulous. However, as a short person I've had trouble finding gowns that fit well. I usually have to alter the straps and make them shorter, and the shaping can be a bit off at times. Not so with this dress! 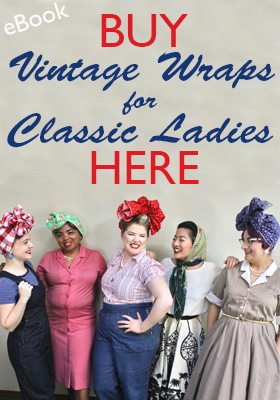 I have an exciting recommendation for those of you that love the look of vintage turbans but don't want to have to tie them all the time: Sarah's Doo-Wop Dos! What a mystery this dress is! Like, seriously, this garment is a mish-mosh of cultures from all over the world, and the more I have researched the crazier this mystery has become. Many of us have incredible outdoor wardrobes, but we haven't built up our indoor wardrobes as much. Perhaps because not many people see it, or it's not a priority for the budget. But I'm here to tell you... pretty loungewear is SOOOO worth it! 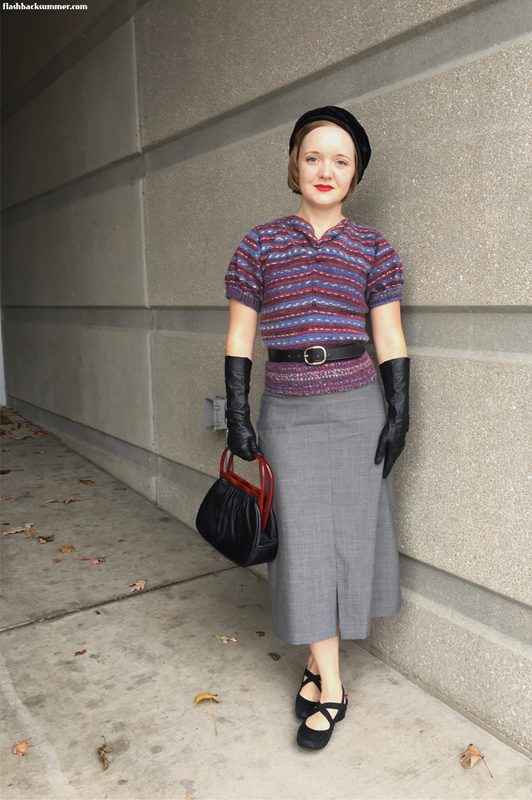 I've been trying to take my vintage style in a more B.A., masculine route to match my changing life roles. I want things that pair vintage style with toughness and resilience. 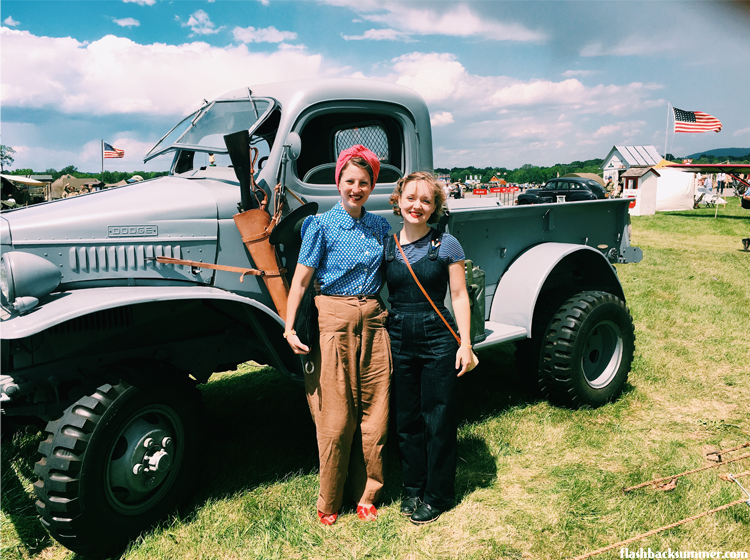 I've often found this combination in vintage motorcycle ladies, WW2 female war workers, female military personnel, and other boundary-pushing ladies of the past. However, most of them seemed to have worn their gear to death, because it's hard to find, and very few people are reproducing such styles. Enter Iron Ranger boots from Red Wing!